We all want to go out with a perfect and gorgeous look. It will make us feel more confident and attractive to talk with other people. Hair makeup is one of the essential steps that you don’t want to skip. 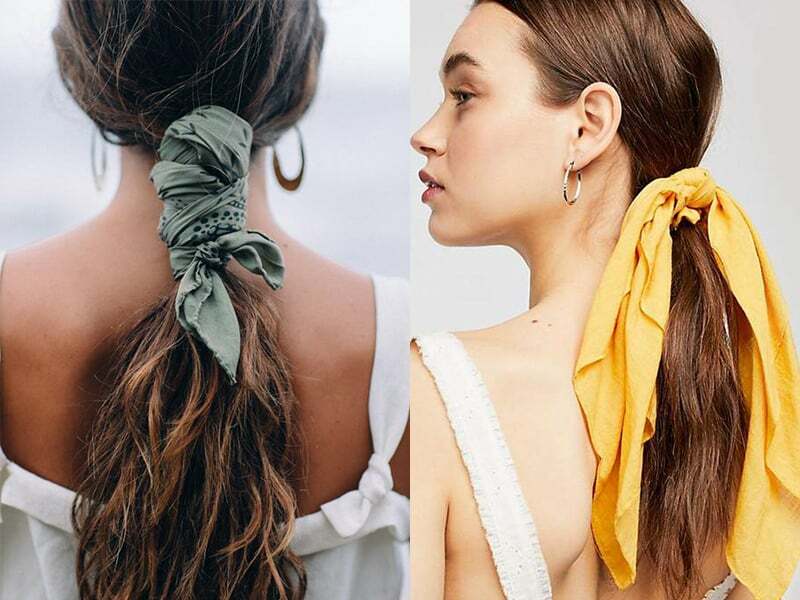 There are many ways to wear a scarf on the hair. 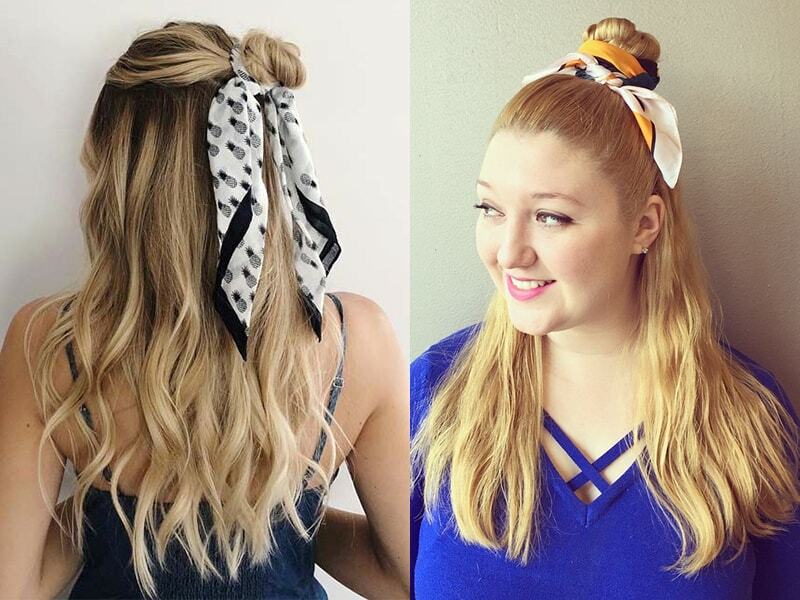 You can make a bun, make a braid, or tie a scarf on hair with your hair down. This article gives the most simple and nice ways on ways to wear a scarf in your hair nicely. 2 How to wear a scarf with your hair down? Many young girls love this hairstyle very much. With a scarf on your hair to make a little half top knot, you will have a bit messy look by using the fingers to comb the hair. Why don’t you make you look different today with the change of look with a scarf? To make a half top knot, you need to prepare a scarf and an elastic band, which is used to hold your hair when you are making this hairdo. Use your fingers and comb your hair on the head top and sides. Hold the half part of your hair with one hand, make an initial ponytail hairstyle. Wrap the ponytail around to make a bun. Secure the bun with the elastic band. Cover the elastic band with the scarf. Wrap the scarf around the half top knot and tie it up to secure. This hairstyle is suitable for office girls, who want to make them look as neat as possible. However, with a scarf, your appearance is no longer too simple. Instead, it makes you become even more gorgeous. You can use this hairstyle for parties or traveling as well. Comb your hair first. Gather the whole of your hair into a mid ponytail. Wrap your hair around to create a bun. Secure it with a plastic band. Use the scarf to tie around the knot; be careful to cover the plastic band entirely. For the messier look, you can hold your hair in a high ponytail. Tie the hair with an elastic band. Pull a part of the hair over the last round of the tying elastic band, leaving the end loose. 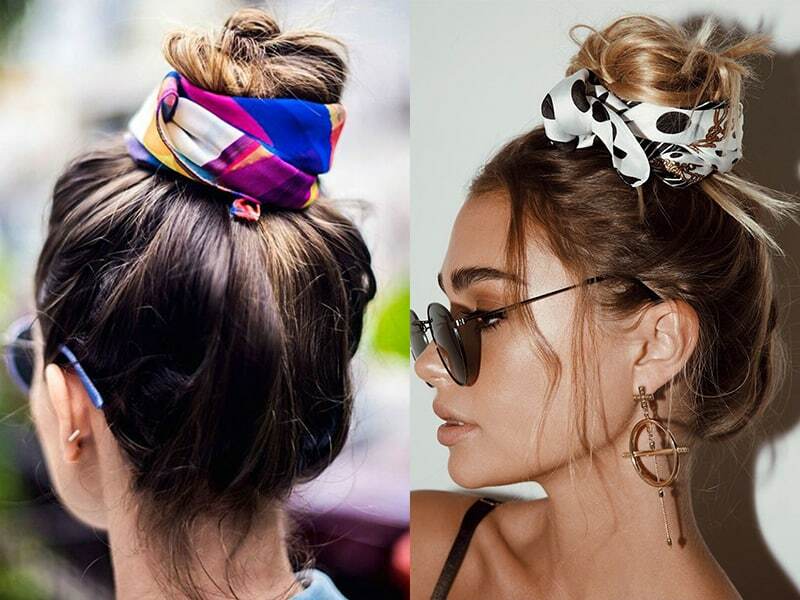 Tie the scarf around the top knot of the bun to secure. Ombre Hair Extensions Braids | These Items Will Change Your Life Forever! 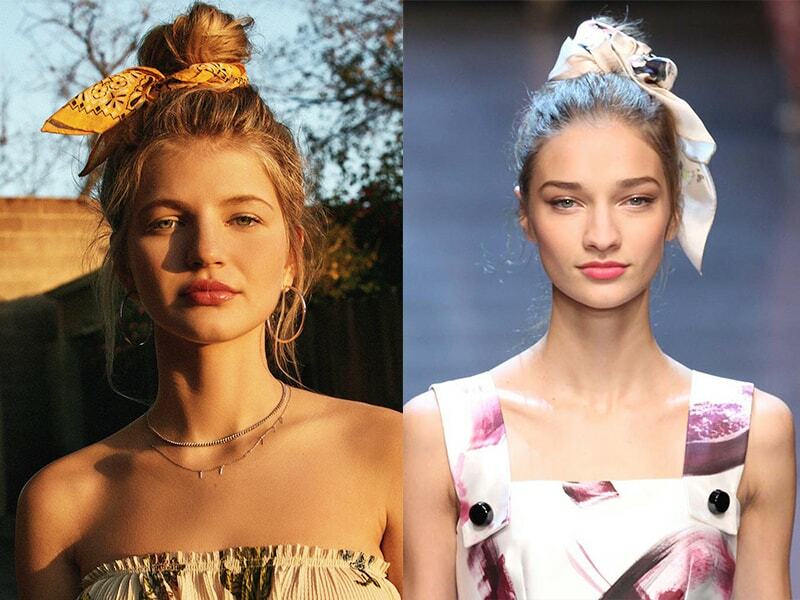 Do you want to know ways to wear a scarf in your hair with the classic vibe? With a low ponytail hairstyle, you will have the most desirable vintage look. Furthermore, it will not take much time to complete this hairstyle. Try this attractive style with the easy-to-follow instruction below. Prepare an elastic band, an iron for curling or straightening your hair, and of course, a scarf. Follow the three steps below respectively. Make your hair look thicker and have more texture with a curling iron or straightening iron. Create some waves for the hair strands. Make a long band by rolling your scarf, following the longest dimension. Put the center of the scarf under the hair ponytail. Wrap around the base for several rounds and tie into a knot. To make this hairstyle attractively, you should use the tying tip from India called Bandana, which means “to tie,” or the scarf in Hindi. You will look pretty with this hairstyle. Just prepare an elastic band with a comb, and the most necessary, a bandana, or a scarf. Here is how you can quickly finish this hair makeup. Remove all tangles with a comb. Tie your hair back into a mid-bun. Let the hair ends fall over the bun top. Fold the bandana to have a long band. Put the scarf at the back of your head and pull its sides over the head top. Take the opposite side and wrap another round to get the ends at the head back. Finally, make a knot with the scarf ends at the nape of your neck to secure the lock. How to wear a scarf with your hair down? With your hair down, you can also create a beautiful hairstyle. 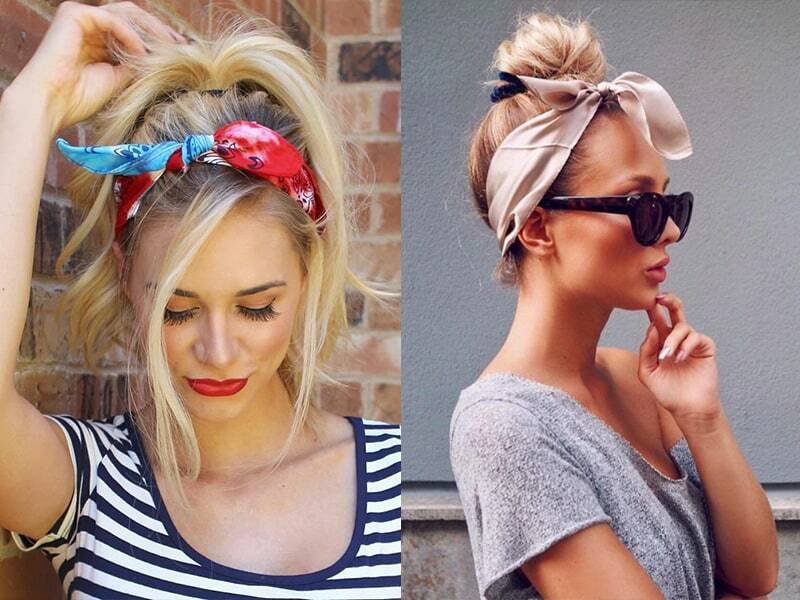 There are many ways for you to tie a scarf on the hair nicely. With a braid on your hair, you have already had a chic look without too much preparation for clothes. The simplest thing you can do is to combine this hairdo with a nice dress. Now you are ready to become really outstanding in a ball. Gather a big part of your hair backward. Make this part into a fishtail braid and use the elastic band to tie the end. Make the braid look more voluminous by pancaking it. Pass a small part of one side on your head over the first braid stitch. Do the same with the opposite side on your head to finish this mermaid braid. 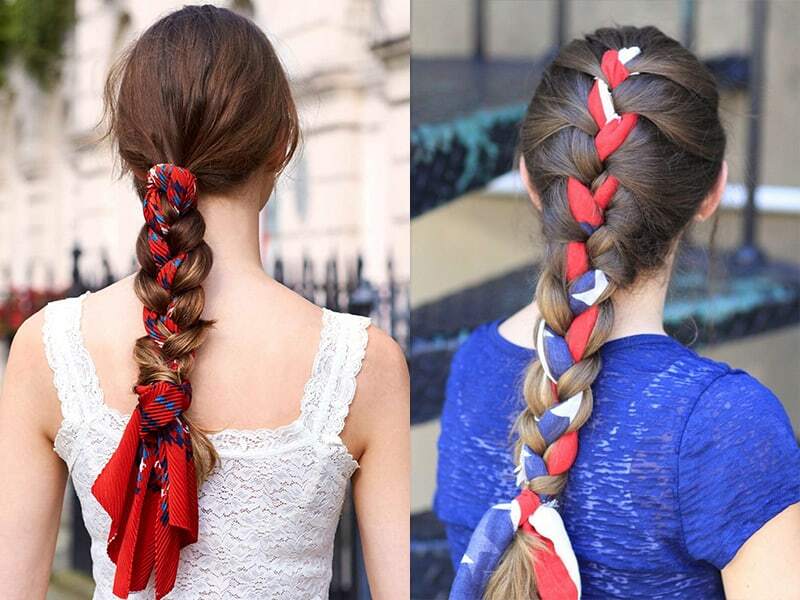 When you do until the end of the braid, tie the scarf on your hair and let the hair ends hang loosely. For some simple changes, you should not skip trying this hairstyle. Although it is quite simple to finish this hairdo, you can still create a super eye-catching look! All you need only include a brush, a square scarf, and a blow dryer. Now you can follow this instruction to complete this hairdo. After washing your hair, let it dry naturally. Make a gorgeous look for your hair by flipping it forward and fluff it up. Make a band with your scarf and put the center of it at your neck nape. Flip back the hair and tie the hair side into a knot on the top of your head. Let the hair ends fall down like a Minnie Mouse bow. Are you ready to go out with a completely new style of yourself? You would love the chic look that is brought only by a scarf. The article has guided you about ways to wear a scarf in your hair beautifully. If it is your style, let’s try some ways suggested above. If it is not, do not hesitate to try once. Maybe you suit it perfectly. Follow Layla Hair for more instructions on different hairstyles!